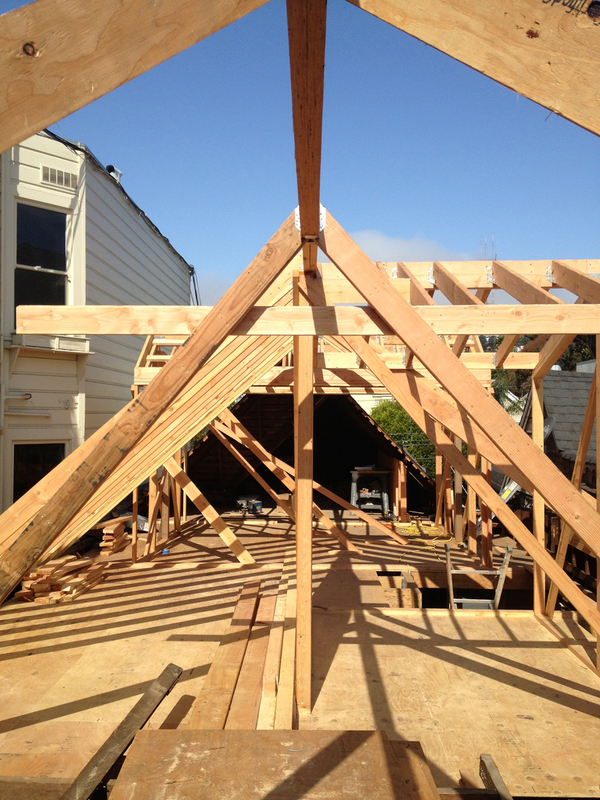 Once the 2×4 flimsy roof was ripped off, the new roof was framed back up pretty quickly. 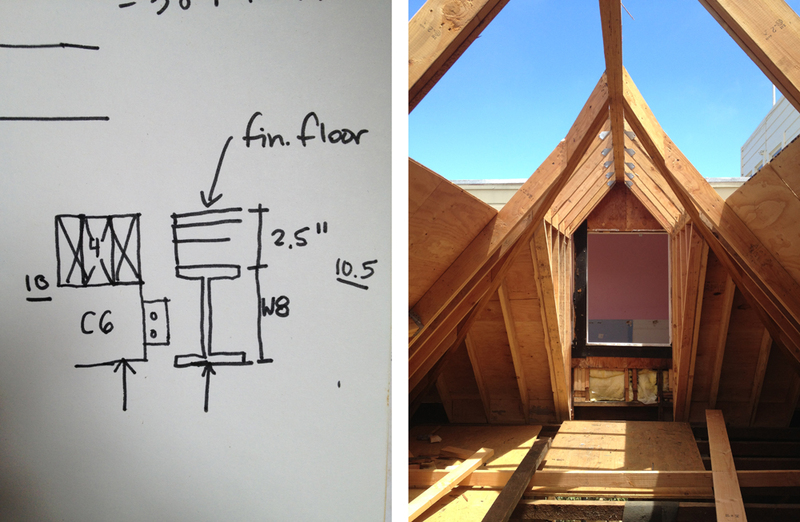 The top floor will have new rooms so we needed to take advantage of dormer space, and as much height as possible. The view above is looking toward the street. On the right is a close-up of the layers of shingles, starting with the original cedar shakes from late 1800s and a series of asphalt shingles right on top. Note there is no waterproofing in the old roofing system! 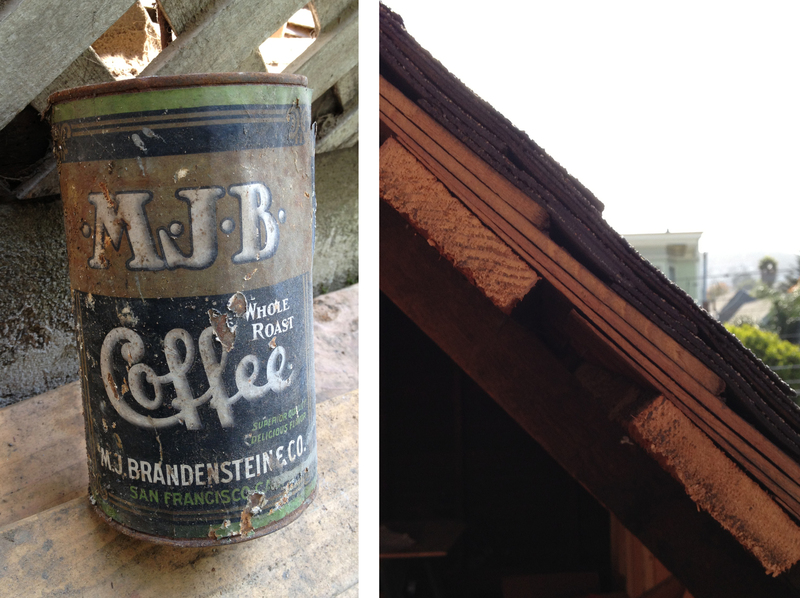 On the left is an old coffee coffee can that was found during demolition. 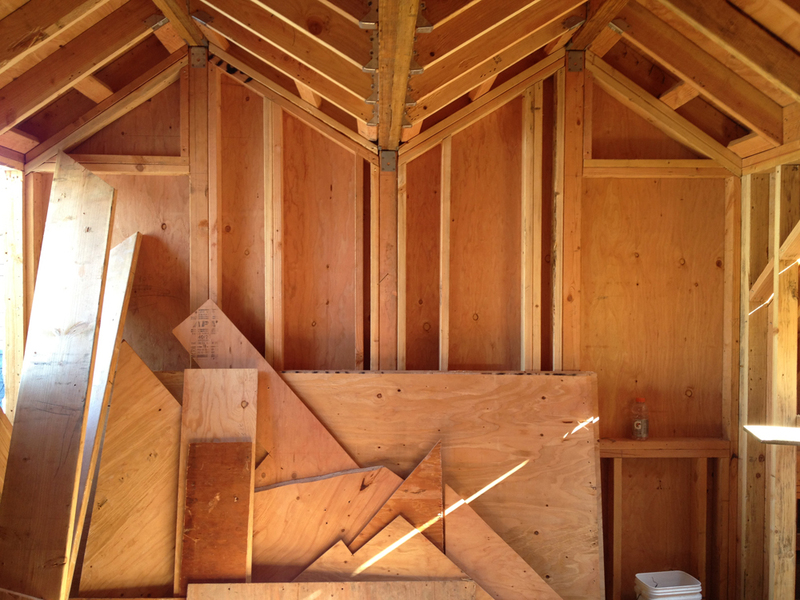 Here is a view looking toward the back of the house; the roof is a tricky series of angles and shapes. At the very back is the square ‘box’ addition from sometime in the ’80s or ’90s. 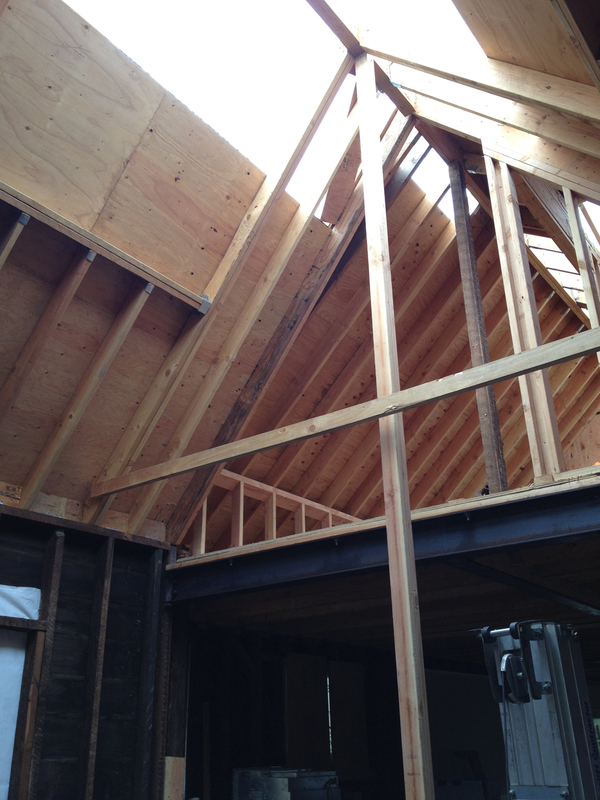 A view from the inside of the new bedroom at the former attic level. 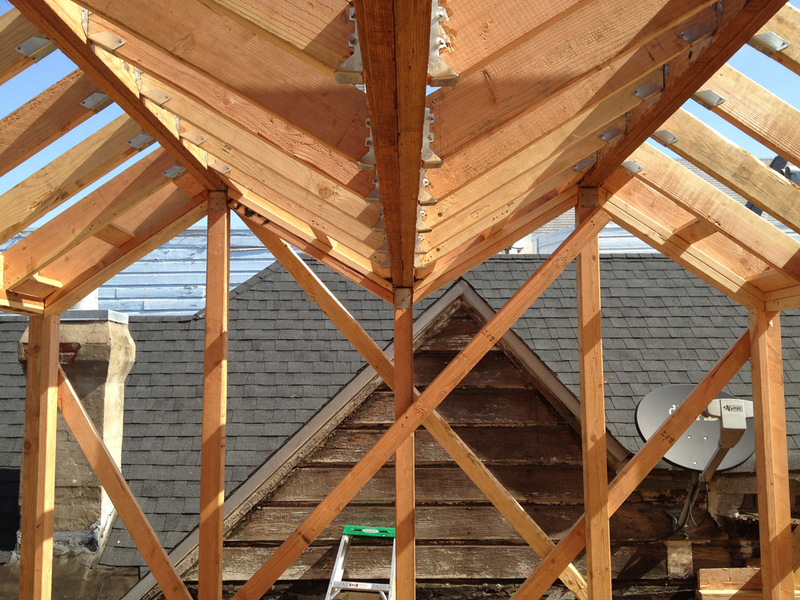 It’s a double-ridge dormer. 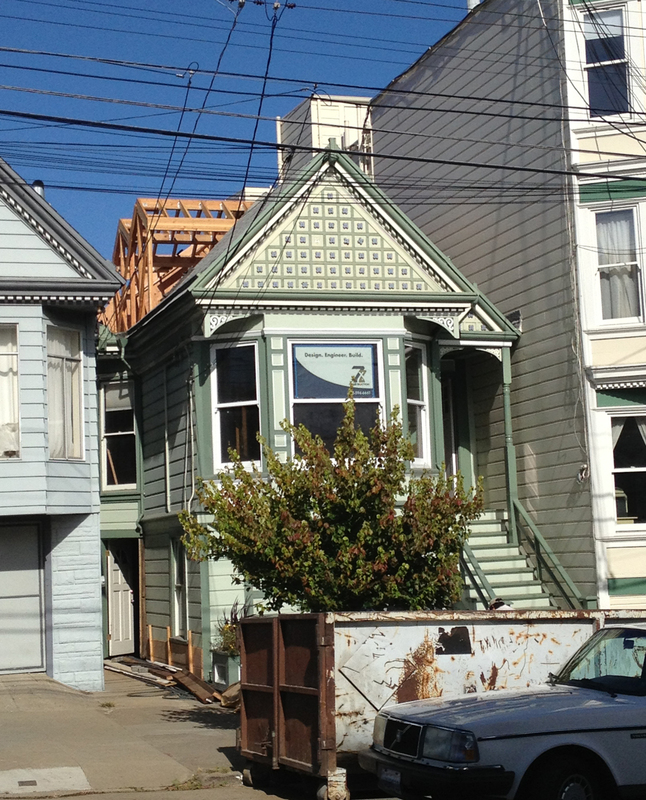 The neighbor’s house is just outside – tight urban living! From the street you barely notice the dormers. There’s my Volvo out front 🙂 The same view a few weeks later after the plywood sheathing has been installed on walls and roof. 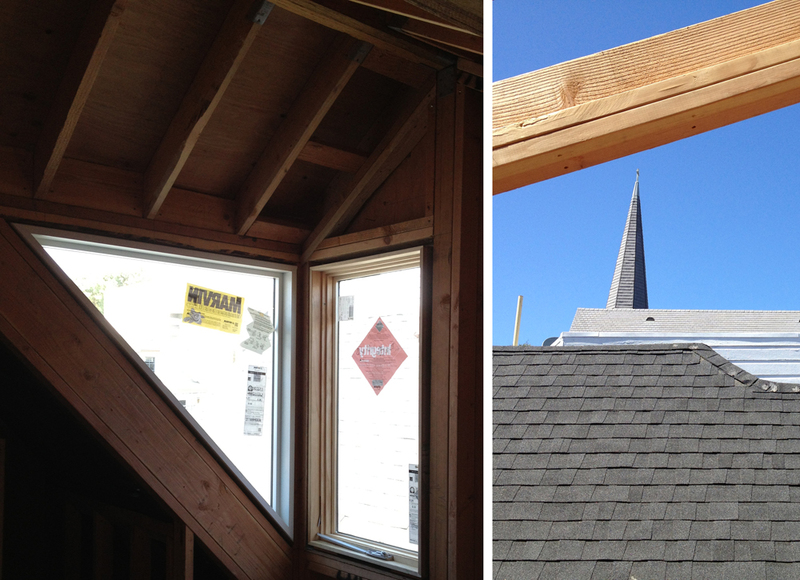 Another few weeks and the windows are installed – this is the corner facing the street and Twin Peaks beyond, so we thought it important to have a window along the slope where the dormer meets the roof. Uncommon, but I was able to dig some examples up online. 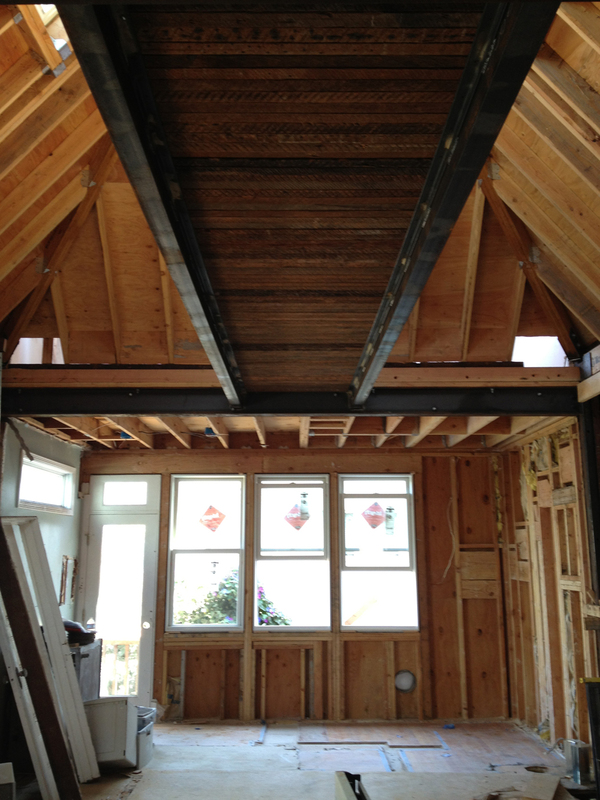 The ‘great room’ will occupy the area at the back of the house on the middle level. 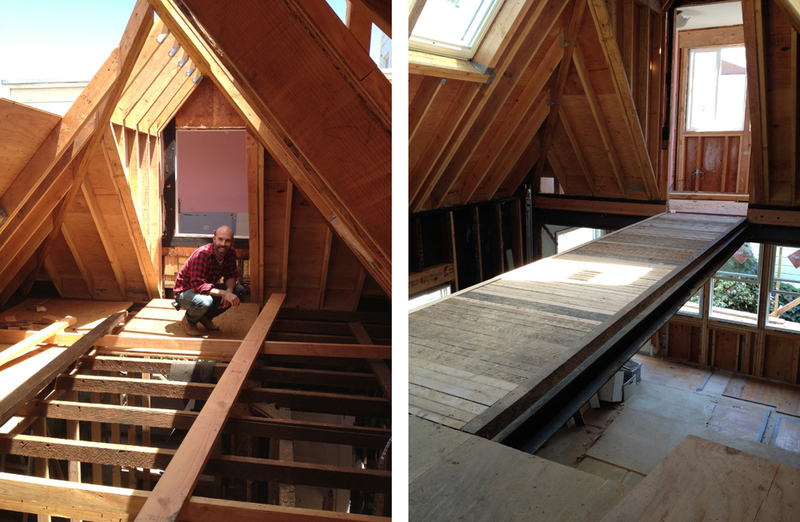 There I am crouched on the old attic 2×4 framing, which we repurposed as a bridge walkway to connect the areas of the new top floor. 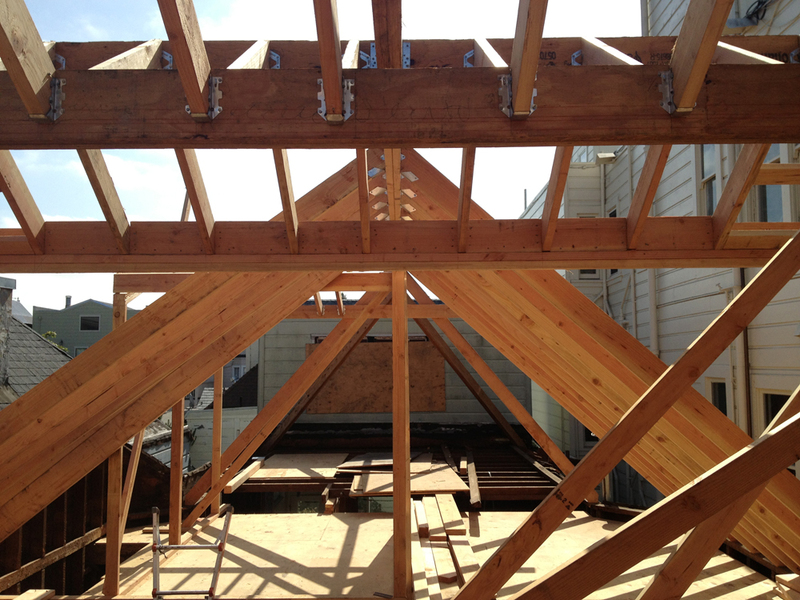 The photo below was taken sometime between the two photos above, once the attic floor was taken out but before the bridge steel was installed. I am SO excited to have this steel exposed in the house; it will be a nice mix of Victorian and modern together, and tell a story of the old framing that was reused to build it. A view below the bridge toward the rear wall. A sketch when we were figuring out how the bridge would meet the floor on each side, which were at different heights! 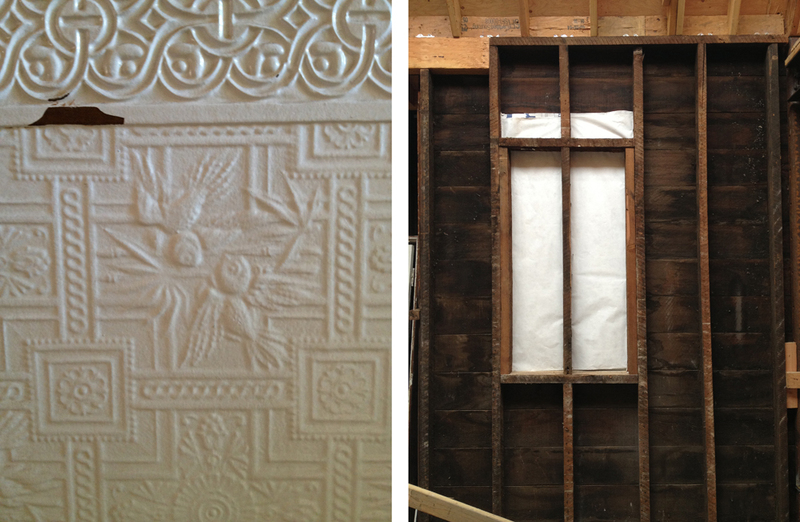 Above is a detail of the existing lincrusta wall covering featuring birds (Swallows?) original to the house. Most of it was removed but will be replaced. Next to that is the rectangle of a closed window found behind the refrigerator. Much of the work at the upper two levels happened while the new concrete footing was being poured around the perimeter of the house at the ground level. Groundwater was discovered during excavation which set the progress at the ground floor back a few weeks.